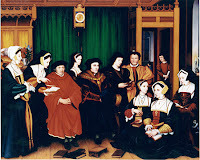 Tomorrow - 22 June - is the feast day of St. Thomas More, martyr and patron of lawyers, civil servants, politicians, statesmen, "difficult marriages" (and this blog). As he went to his death, ordered beheaded by Henry VIII for refusing to swear the Oath of Supremacy declaring the King head of the Church in England, More humbly stated that he would die "the King's good servant, and God's first." Profile: Studied at London and Oxford. Page for the Archbishop of Canterbury. Lawyer. Twice married, father of one son and three daughters, and a devoted family man. Writer. Friend of King Henry VIII. Lord Chancellor of England, a position of power second only to the king. Opposed the king on the matter of royal divorce, and refused to swear the Oath of Supremacy which declared the king the head of the Church in England. Resigned the Chancellorship, and was imprisoned in the Tower of London. Martyred for his refusal to bend his religious beliefs to the king's political needs. Pray that my family may find in me what yours found in you: friendship and courage, cheerfulness and charity, diligence in duties, counsel in adversity, patience in pain -- their good servant, and God's first. 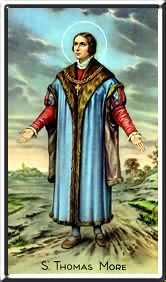 Canonized by Pope Pius XI in 1935 as the "Martyr of the Papacy"
Saint Thomas More, born in 1480, was the precocious and amiable son of an English magistrate. Very well educated and brilliant, when he was placed at the age of fifteen in the household of the Archbishop of Canterbury, he soon attracted the Archbishop's attention, and was sent by him to study at Oxford. He debated interiorly for a long time as to whether he should become a priest, but decided otherwise with the approbation of his director. The practice of civil law was not enough to absorb all his time or energy. The author of the famous satire "Utopia," wrote poetry while still young, in both English and Latin. He had completely mastered Latin, as he had also the Greek tongue, "by an instinct of genius," as one of his preceptors said. Saint Thomas in 1505 married a virtuous and beloved wife who, after bearing four children, three daughters and a son, died six years later. His second wife, older than himself, took excellent care of the household and of the children; but it was said she could not grasp the sense of her husband's subtle humor, which was a characteristic trait of his cheerful disposition. Saint Thomas came under suspicion by King Henry VII when he strove in the Parliament to reduce the burden of excessive taxes which the people bore, though he never spoke against the king. But his capacities were appreciated, and when Henry VII died, his 18-year-old son, who was to become Henry VIII in 1509, showed him great favor during the first twenty years of his reign. Saint Thomas was knighted in 1521, and was made Speaker of the House of Commons in 1523, High Steward of Cambridge University in 1525, and Chancellor of the Duchy of Lancaster in the same year. Nonetheless, the king's protege foresaw what could easily happen to anyone who did not agree with his sovereign; he said to his son-in-law in 1525, "If my head could win him a castle in France, it would not fail to go." In effect, when in 1530 the order was issued to the clergy to acknowledge Henry as "Supreme Head of the Church, insofar as the law of God would permit," Saint Thomas immediately resigned as Lord Chancellor. His resignation was not accepted. Two years later, in May 1532, after he had lost the royal favor on several counts — his reticence concerning the king's divorce, his non-attendance at the king's illegal marriage, and his formal non-recognition of any future children of Henry and Anne Bolyn as rightful heirs to the throne — he was permitted to retire. The king, the apostate Archbishop Cranmer, and Anne Bolyn were all excommunicated in that year. Saint Thomas lived in retirement from the age of 52, his revenues considerably diminished, and his health somewhat uncertain. 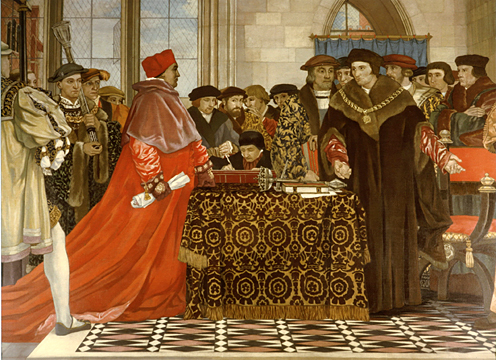 When the king decided to require of the laity, as well as of the clergy, the oath supporting his alleged "supremacy," he wanted to obtain first of all the signature of Thomas More, to make of him an example. The Saint declined to sign the oath and thereby brought upon himself a sentence of incarceration in the Tower of London, and a short time afterwards, of death. He was beheaded in 1535, after having said, with his ordinary humor, that "he did not consider the severing of his head from his body as a circumstance that should produce any change in the disposition of his mind." Saint Thomas while in retirement continued to write a number of religious treatises of great value, including an unfinished one on the Passion. He was beatified by Pope Leo XIII and canonized by Pius XI in 1935, with Cardinal John Fisher, who was martyred like himself in the same year and for the same reasons. That year was the 400th anniversary of their death. "These things, good Lord, that we pray for, give us Thy grace to labor for." --Saint Thomas More. 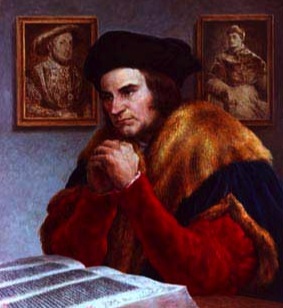 Sir Thomas More - Oregon State University Philosophy Dept. "Give me thy grace, good Lord: To set the world at nought" by What Does the Prayer Really Say? Great post, Jay. I'll likely do some "Thomistic" reading this evening. Too bad I won't be doing it in London. Yay for St. Thomas More, patron of my legal career and (as an honorary Dominican, even though he once thought about joining the Franciscans, but we won't hold that against him) co-patron of my Dominican vocation. I think St. Thomas More is responsible for obtaining for me a great sense of humor. 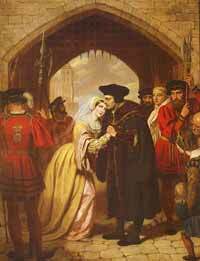 St. Thomas More, pray for us! P.S. 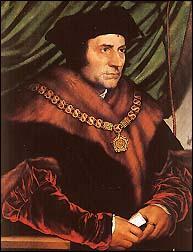 Where did you find that cool St. Thomas More prayer card? I have been quite unable to find any such thing, and my local Catholic bookstore can't scare any up! You can get the prayer card here. 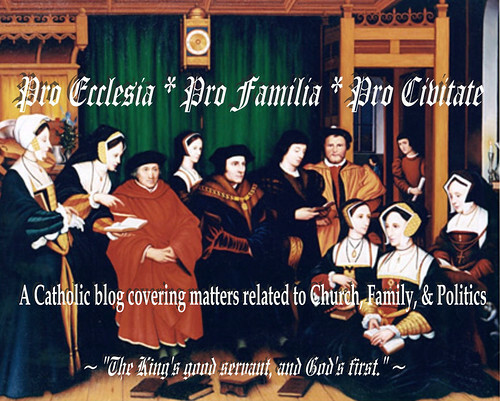 Always a great post when it concerns Thomas More! Happy feast day! An excellent and detailed post! A Man For All Seasons, one of my favorite movies.